Shop online for 4 greenberg model trains at discounts up to 16%. This is the "Modern Toy Train Repair and Maintenance" Book from Kalmbach. Author: R.D. Teal. 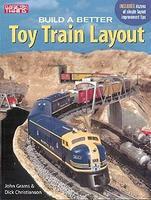 This is the Classic Toy Trains "Build a Better Toy Train Layout" Book from Kalmbach.